Massage Chair Airbags and Air Massages: Are They Helpful? Massage chairs are a convenient way to regularly incorporate massage into your healthcare regimen, providing all the benefits of a massage as and when you desire. These days, massagechair.com are more advanced and have more features than ever before, which can quickly turn the seemingly simple task of choosing a massage chair into a complex decision. If you are looking for a full body massage chair, the choice between rollers and airbags is likely to be a key selection in your search. In this article, we’ll discuss the difference between the two, and why you would choose an airbag massage chair. ​What are massage chair airbags? 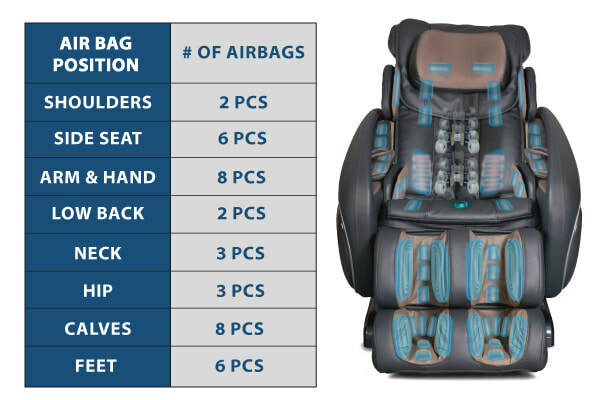 These airbag features apply to the Osaki OS-4000Airbags are another way to incorporate massage techniques into your massage chair. Generally, they will be located in areas that the rollers cannot reach as easily, such as the shoulders, neck, arms, legs and feet. Some airbags may also be included to position different areas for rotation – such as a lower back rotation. This works by pushing your lower back forward with one inflated airbag, and then rotating one side of your hips by inflating a second airbag, rotating and releasing your lower back. ​How does air massage differ from other massage techniques and features? An airbag will provide a compression massage, as opposed to the kneading, rolling, or tapping motions provided by rollers. While airbags can be used to simulate these techniques by rapidly inflating and deflating them, it is much more common for them to be performed by massage rollers in the massage chair. When performing the massage, the airbags will inflate around the area to be massaged—such as your arm—and compress the area. The intensity will vary depending upon how much the airbag is inflated. ​What are the health benefits of using air massage technology? Compression is a safe and widely used technique to improve blood and lymph flow. A popular example is compression socks, which are used to improve blood flow to the feet and help improve circulation. The compression massage created by the airbags in a massage chair provides the same effect, helping enhance circulation while also massaging tired, aching muscles. Swelling can also be relieved using compression massage. Just like compression socks, the compression of tissues improves lymph flow (the fluid that cells are immersed in) which helps reduce swelling and prevent swelling from re-occurring. Improving blood flow to an area is also a key way to help muscles recover from injury or sports, as blood carries oxygen and nutrients which will help the muscle to repair itself. ​What are some of the top chairs on the market? When it comes to full body massage chairs with airbags, there are two chairs that significantly outperform the competition. The two we recommend are made by Osaki, and include the OS-TW Pro 3 and the OS-4000 Zero Gravity Executive full body massage chairs. The OS-TW Pro 3 features an air massage system, featuring airbags located at the upper and lower arms, the sides and back of the calves, the sides of the ankles, and the top of the feet. Each airbag can be independently controlled for targeted massage exactly where you need it. For example, your calves will be gently kneaded by the wave effect of the airbags inflating from one side to another. As one of the most advanced airbag full body massage chairs, the air pressure area as well as the airbag pressure can be varied through the handy remote, allowing you to fully customize the massage area and intensity to your comfort level. Combined with the other features such as a body scanner, heated pads, zero-gravity recline, and the L-track design, the OS-TW Pro 3 will provide all the benefits of a massage in a feature-rich package. With no less than 38 airbags, the OS-4000 Zero Gravity Executive massage chair provides the most advanced air massage available. Airbags will massage the feet, calves, hips, waist, lower back, arms, hands, neck and shoulders. In the arm, calves, and foot airbags, pressure points are activated by the use of rubber stimulators for an invigorating massage. For the lower back and hips, the OS-4000 provides a hip and lumbar squeeze, as well as using the airbags to position you more closely to the rollers for a deeper back massage. The neck and shoulders can be compressed and stretched to release tight muscles in these areas. Also featuring a body scanner, heated lower back pads, seat vibration, zero-gravity recline, and an S-track design, the OS-4000 is an excellent choice for an airbag full body massage chair. ​Where can I buy a massage chair with advanced air massage technology? 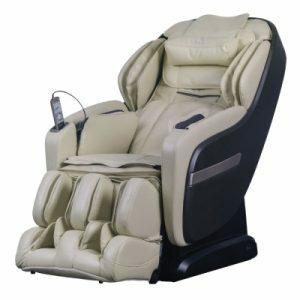 When purchasing a massage chair, osakimassagechair.com has a wide range, low prices, and excellent customer service. Specializing in importing and distributing direct to consumers, Titan Chair has a high-quality massage chair to suit every need and budget. In addition to selling massage chairs, Titan Chair also provides maintenance services, for a hassle-free customer experience. Airbag full body massage chairs are an excellent choice for compression massages. If you suffer from poor circulation and swelling, or participate in sports, the compression massage provided by an airbag massage chair will help improve your conditions and promote muscle recovery, as well as provide all the other benefits of a massage. What is a Shiatsu Massage Chair, And Why Should I Get One? Imagine coming home at the end of a long, stressful day to a warm and relaxing massage that melts away your stress and tension and leaves you feeling refreshed and relaxed. Unless you are living with a massage therapist, chances are that this is just a dream. But wouldn’t it be amazing to have a massage as and when you need it? With a massage chair, you can. Coming in a convenient and affordable package, massage chairs have a range of different massage techniques depending on what kind of massage you would like. Shiatsu massage chairs are an excellent option for a whole body massage, featuring a range of motions for the best massage experience. Shiatsu massage is a Japanese massage technique, and the word shiatsu means “finger pressure”. Similar to a Western massage, the technique combines touch, tapping, rolling, kneading, stretching, mobilization, and acupressure to promote relaxation but also to encourage healing. While often referred to as massage, the Japanese use shiatsu as a form of energy work to release energy (or Qi) blockages and balance energy flow within the body. They believe that blockages in the Qi energy are what cause pain, and releasing them helps the body to heal itself. As a form of massage, it can help with releasing muscle tension, reducing stress, and promoting relaxation. But as shiatsu works with the whole body, it can also help relieve headaches, relieve painful symptoms of chronic conditions such as arthritis, improve circulation, aid with digestive and skin disorders, menstrual difficulties, depression, and even emotional issues. The best shiatsu massage chairs available are those that incorporate an array of features to ensure that you get the best experience from your massaging chair. While most massage chairs have different programs and massaging styles, not all of them on the market include a shiatsu massage option. For the ones that do, here are three top quality affordable picks are below. The OSAKI TW-CHIRO is designed to accommodate a range of heights and body types, featuring a wider seat base and taller backrest for a comfortable fit. Other massage chairs have fixed motors that just knead your skin, whereas the Osaki TW-Chiro incorporates an advanced 3D body scan and massage. The computer sensors will scan your back and the massagers will project out from the chair by up to 2 inches, simulating the hands of a shiatsu massage therapist to provide relief where your body needs it. Airbags are included to help extend areas such as shoulders and legs for additional stretching, or envelop areas for complete relief. With 16 preset programs and a reclining option, the TW-Chiro is an excellent shiatsu massage chair. 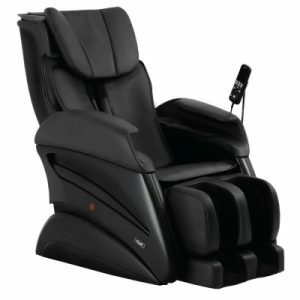 Featuring a zero gravity reclined position, the OSAKI OS-4000 massage chair aligns your back and thighs for comfortable positioning, maximizes the intensity of the massage, relieves pressure on the spine, and improves circulation. Ergonomically designed to contour to your spine, the sensors will scan your body and adjust the massagers’ position, customizing your massaging chair to reach all your key areas. 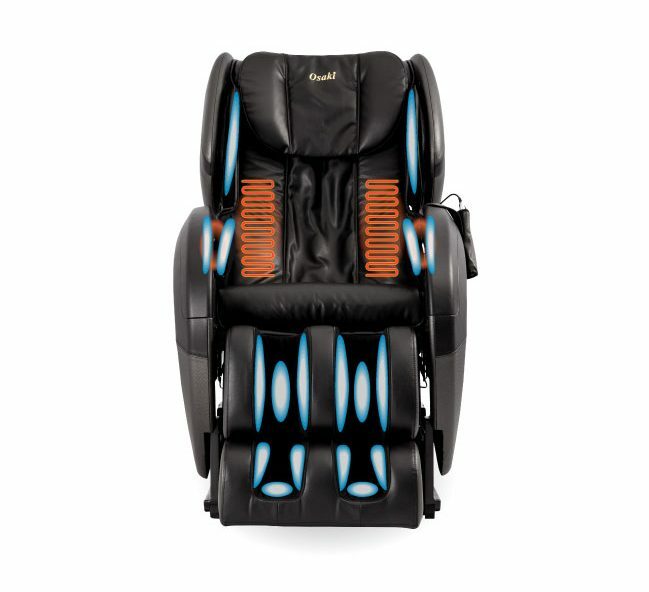 With airbags incorporated into the design, the OS-4000 reaches all areas to ensure a whole-body massage experience. The heated pads, remote control with large viewing screen, 8 preset programs, and vibration options make the OS-4000 a premium massage chair that is bound to please. The Titan Pro Summit incorporates and S and L track massage, so the massagers can range from the neck all way to the hamstrings. 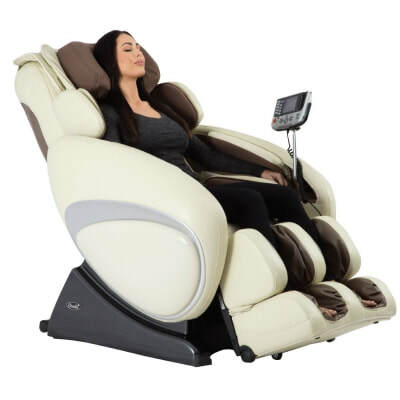 Like the Osaki massagers, the Pro Summit shiatsu massage chair features body scanning technology, to self-adjust to your body shape, and zero gravity reclining positions. The lumbar and shoulder regions feature heated pads for extra relaxation, and airbags are included for compression massages and stretching across the arms, legs, waist, and shoulders. The space-saving design means that this chair takes up less than 5 inches of additional space when reclined, making it the ideal shiatsu massage chair for smaller areas. 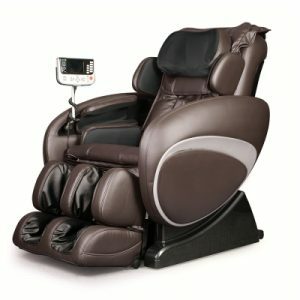 The Pro Summit includes roller foot massagers to stimulate acupressure points in the feet, seat vibration, manual massage selection as well as preset programs, and even boasts a USB charger for your devices while enjoying your massage chair, making it a fully-featured massage chair for maximum enjoyment. Buying a massage chair for home use is an important investment, so it’s crucial to select a retailer that you can rely on. Osakimassagechair provides high-quality massage chairs direct to customers at prices to suit every budget, often well below national retail prices. As well as products you can trust, Osakimassagechair offers superior customer service when buying or maintaining your shiatsu massage chair. Shiatsu massages offer far more benefits than just pain relief, encouraging improved mental, physical, and emotional wellbeing. By getting a shiatsu massage chair for home use, you can benefit from the unique holistic experience of shiatsu at a time and place that suits you. Massage chairs are a fantastic way to wind down and enjoy a massage in the comfort of your own home. 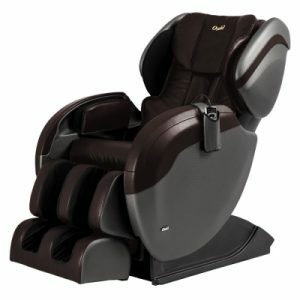 Nowadays, top quality massage chairs come with a variety of advanced features such as S track and L track rollers, foot rollers, auto-programs, airbags, multiple massage techniques, and zero gravity positioning. The zero gravity positioning is one of the most popular massage chair features, but what does “zero gravity positioning” actually mean and why is it a highly sought out feature? What Are the Benefits of Zero Gravity Positioning?